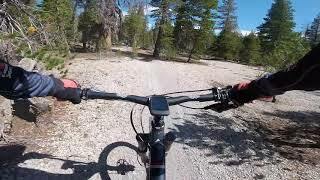 This is one of the best public mountain bike trails in the Mammoth Lakes area. Theres an ample amount of stellar singletrack, and some wider jeep roads/doubletrack as well. Recently, efforts have been made to narrow these wider sections, and they're already turning into great singletrack. You get some great views and open vistas, and lots of forested twisty riding through pine forests. Its really a gem. It can be a little confusing, as there is also a Mountain View Trail at the Mammoth Mountain Bike Park. The trail we speak of here stretches from the Earthquake Fault parking area to just below Minaret Vista and is a USFS signed route. Many people ride this trail as an out and back or connect it with Uptown Trail, Downtown Trail, Starkweather Trail, San Joaquin Ridge Trail, or other Bike Park trails (Beach Cruiser, etc) to make longer rides. It's also possible to shuttle by driving up to Minaret Vista. Access: From town, drive up Highway 203 towards Main Lodge of Mammoth Mountain Ski Area. Make a right turn at the Earthquake Fault sign. Park in the lot. The trailhead is signed and is just below the parking lot. tied into downtown trail. Very fun. Not a soul on this trail for a busy weekend. high altitude, if coming from the flatlands, you will be gasping.